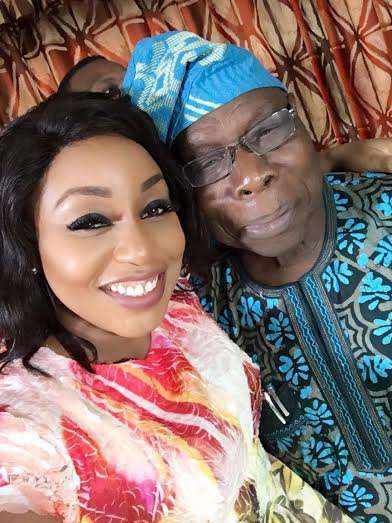 Nollywood diva Rita Dominic was recently pictured with former Nigerian president Olusegun Obasanjo. The actress who stars in the yet to be released movie "76" was seen with the former president during a screening for the movie "76". Dominic who was decked out in a in a white print peplum blouse and black pants joined by co star Chidi Mokeme and Tonye Princewill amongst others. In a career that has spanned 18 years, Rita Dominic has managed to stay youthful, elegant and relevant in the movie business. While most of her contemporaries have retired or have faded into oblivion the Imo state actress is still in the thick of things. On July 10, 2016 Rita Dominic was featured on the VIP series by E! The only Nigerian celebrity to have featured on the programme is Tiwa Savage. Rita Dominic remains the only Nollywood star to grace the series. She has been able to upgrade herself from a movie star in the old structure of home videos that Nollywood churned out during the golden era of the 90s to the early 00s to a stakeholder in the glitzy, polished Nollywood of movie premieres and red carpets.